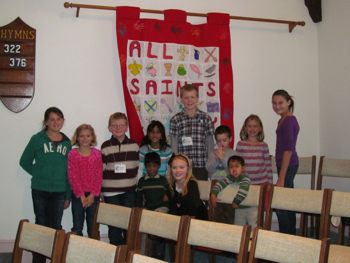 In our education programs for children we work to cultivate an abiding sense of God's loving, affirming presence. We want every child to know that God loves them just the way they are, and that each of them has the power to bless the world by sharing the gifts they have received. Our children are invited not only to learn the stories of the Bible, but also to live what they learn by practicing kindness, compassion, generosity, and forgiveness. Our teachers and classroom helpers are all volunteers, dedicated members of the church who work to establish a safe, community-minded, mutually supportive environment for spiritual formation. From September to June we offer classes on Sunday morning for ages 3-12. In 2014 we have three levels: Preschool, Primary (K-2), and Middler (3-6). Classes meet downstairs during the early worship hour, after the children have shared in the beginning of the 9:00 worship time in the sanctuary upstairs. Our curriculum (www.shinecurriculum.org) places a special emphasis on Christian community, the inner life of the Spirit, and the expression of faith through a life of peacemaking and compassionate service. Any child is welcome to attend; there is no need to register ahead of time, and you don't have to be a member of St. Paul's to participate. When the youth reach middle school they are invited to participate in a confirmation program led by Pastor Jonathan. This is an opportunity for our young people to engage their faith on a deeper level so that they can decide whether they are ready to affirm the promises made on their behalf when they were baptized. For a week every summer we host a bunch of children from the church and the surrounding neighborhood at VBS, which always includes lots of singing, craft-making, storytelling, playing, and snacking. For the past few years we have been developing our own VBS curricula. Recent themes included "Make a Joyful Noise! ", which was an exploration of music as a spiritual gift, and "Heroes of the Faith," which connected the lives of some historical people—Brother Juniper, Sojourner Truth, William Wilberforce, Julian of Norwich, and Dorothea Dix—with the heroic spiritual gifts that everyone is empowered to share. Click here to learn about our VBS program from 2018. During the summer months, when we have one worship service at 10:00am, we offer a special children's program (all ages together) during the service so that children always have the option of staying in worship or attending a program with their friends. Thanks to the talents of our members, these programs have a unique theme each week, and encourage children to be creative and have fun together.